Are Black Mega Churches More Concerned With Money Than Souls? *Rock climbing walls, kids’ spaces that resemble small Disneylands, bookstores and state-of-the-art sound systems represent today’s Black church – supersized. Black mega churches draw huge numbers of worshippers and receive millions in collection plates. Black Mega churches are successful corporate entities that seek to service all the spiritual and social needs of their communities. 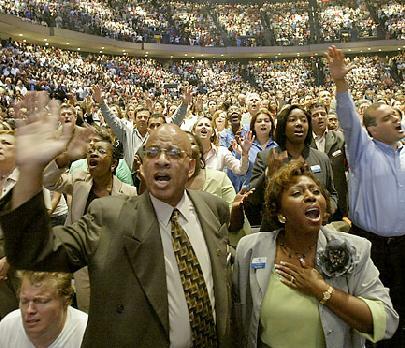 Black mega churches’ pastors are major corporate CEOs shepherding large business bases. Mega churches are characterized by congregations of from 10,000 to 25,000 and spectacular buildings which house sanctuaries, day-care centers, bookstores, and health centers. Most resound with crowds and activities seven days a week, and own businesses, subdivisions, and separate community activity buildings. Almost all mega churches have TV pastorates, feature high-tech video along with foot-tapping music. There are less than 50 nationwide, but Dallas-based Bishop T.D. Jakes, Houston’s Kirby Caldwell, Atlanta’s Eddie Long, Creflo Dollar and Los Angeles’ Charles E. Blake have grown their memberships by preaching material success and sales their books, festivals, and movies. Their congregations have expanded into businesses such as: schools, assisted living facilities and ex-offender re-entry programs. Some African Americans leaders find the growth of these congregations worrisome; saying these pastorates focus on messages of personal prosperity and turn their backs on the struggle for civil rights. YES … Mega Churches and The MAJORITY of Small Churches in America are more concerned about money, power and control. 95+% of ALL BUILDINGS IN AMERICA that are used to WORSHIP GOD are just buildings (dens) of thieves, manipulators and unholy leaders. James 2:6 But ye have despised the poor. Do not rich men oppress you, and draw you before the judgment seats? *Follow 21* *Jeremiah 13:21 What wilt thou say when he shall punish thee? for thou hast taught them to be captains, and as chief over thee: shall not sorrows take thee, as a woman in travail? = 1st Thess 5:2-3 For yourselves know perfectly that the day of the Lord so cometh as a thief in the night. For when they shall say, Peace and safety; then sudden destruction cometh upon them, as travail upon a woman with child; and they shall not escape. If you are worried that your church is more worried about money, then don’t go to that church. As long as you and your family are taking from the experience what you are supposed to take from it, it’s all good.